his co-owner is Petra Keulers, kennel Sumanshu. We have a new Guestbook (in two language English and Czech), all old messages have been imported. I advise our News from the dog world - the next year will be rich of interesting events. 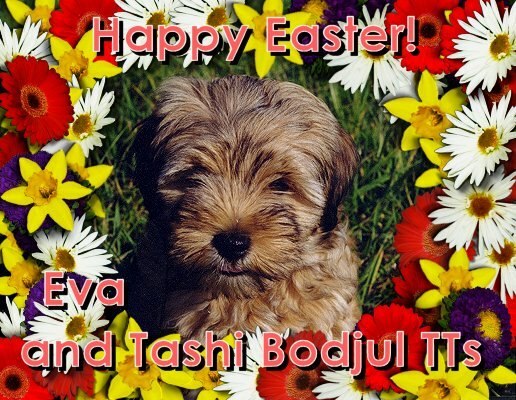 Also new updated our links to Tibetan Terrier breeders. Pohodovou výstavu posuzovala paní Olga Dolejšová, předvedlo se 14 TT. a ještě se umístil v soutěži Best in Group IX, a to na krásném třetím místě !!! Máme ze všech velikou radost a srdečně blahopřejeme Janě a Simoně! ve velkém kruhu a takový kruh pro závěrečné soutěže v Boleslavi opravdu je. plemene. Při soutěži veteránů běhala s obrovskou vervou a paní rozhodčí Mgr. Božena Ovesná si ji vybrala do finále. Our Jomi - excellent 1, CAC. On Saturday 21.08.2004 in Bratislava - contest the World Champion of Champions. FCI VI. - 20, FCI VII. - 18, FCI VIII. - 14, FCI IX. 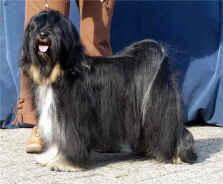 - 40 (three Tibetan Terriers), FCI X. - 19. "The Gold Victor - the World Champion of Champions" - azavakh Ahmar Kel-Es-Suf from the Czech Republic. National Dog Show Glogow 01.08.2004:. Our Jomi has finished the title Champion of Poland aged nearly 22 months! National Dog Show Mlada Boleslav 25.07.2004:. International Dog Show Brno 27.06.2004 - entered 19 TTs, judge - Mrs. Alena Kostalova. Sincerely congratulation to all owners of our babies! 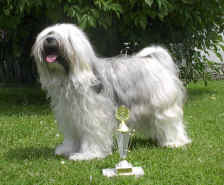 International Dog Show Krakow 26.06.2004 - Jowo Rinpoche - excellent 1, CWC, CACIB, Best male, BOB. Club Winer Show TTC Sobeslav 19.06.2004 - our club has celebrated the 30. anniversary of the Tibetan Terrier breeding in Czechia and record number 46 Tibetan Terriers were entered to the show!!! The Club Show was in Sobeslav (a small town in the South Bohemia) again, the judge was Mr. Leos Jancik. Our veteran Djingi (aged fast 9 years) - Best Veteran of Breed and above all Best Tibetan Terrier of the Club Winner Show 2004 - BOB ! And also BIS Veteran 3. and BIS 3. He is still in the best condition. Very nice success of our young Jomi - Excellent 1, CAC, Club Winner 2004, BOS. Her dam Villi (9,5 years) - excellent 1, winner of the honorable class. Jomi's litter brother Jamyang - excellent 1, CAC, Club Winner 2004. Bara, well done !!! the winners of the Memorial Biba - hope of the breeding - descendants of our Villi. Great congratulation to all owners! National Dog Show Banska Bystrica (SK) 09.05.2004 - Jowo Rinpoche - V1, CAC, National Winner, BOB. Djingi - excellent 1, Best Veteran in Breed, Best Veteran in Show !!! We are very happy, Djingi made the wonderful start of his showing in the veteran class. Aran - excellent 1, CAC, CACIB, BOB. Jowo Rinpoche - excellent 1, CAC. Jowo has finished Czech Junior Champion. Jamyang - excellent 1, CAC, res.CACIB. Jamyang was the second best male behind our Aran. Jomo Lang-ma-ri - excellent 1, CAC, res.CACIB. Also Jomo has finished Czech Junior Champion, she was the second best female behind our Jomi. Jana, Lenka, Bara and Magda, many thanks and congratulation for your good work! There are the new pictures of Jogy, Djingi and He-ru-ka in our photogallery. Many congtatulations to Jana and Magda! 14.03.2004 - two Dog Shows in Nitra (Slovakia) and we are very happy of results. Our Djingi - last time in the champion class - excellent 1, CAC, BOB. but he will be shown in the veteran class :-))) Our Jomi was excellent 1, CAC. Jowo Rinpoche - excellent 1, CAC. Aran's daughter E'Sengemo od Vilzonky - excellent 1, CAJC. He-ru-ka - excellent 1, CC, Jomo Lang-ma-ri - excellent 1, CC. our Jomi, Jowo Rinpoche and Aran's daughter E'Sengemo od Vilzonky - Club Junior Champion SKCHTaF. Many kisses to all owners and dogs !!! Our Jomi has finnished the titel "Club Champion TTC" only 16 months old! We are very proud of our sweet little girl !!! Our Jomi (16 months old) in the open class - excellent 1, CAC, CACIB, BOB. Jowo Rinpoche - excellent 1, CAJC. Many congratulations to Jana, Bara and Lenka !! JCh. Tashi Bodjul Jamyang - V1,CAC, Tashi Bodjul Jowo Rinpoche - V1, CAJC, BOB (in 15 months). Both boys have finished Slovak Junior Champion! Sincerely congratulations to Bara and Lenka! 10.01.2004 - our homepage has been moved to the new URL and has got the new look.